Whilst German and British dignitaries, including The Princess Royal, Prime Minister David Cameron and German President Joachim Gauck, commemorated the Battle of Jutland in Orkney today visitors to HMS Bulwark at nearby Hatston Pier, in Kirkwall, would have seen a great symbol of how much things have changed between the two countries over the last 100 years. Sustainable Marine Energy (SME) played its part in the commemoration of the Battle of Jutland this week in Orkney. 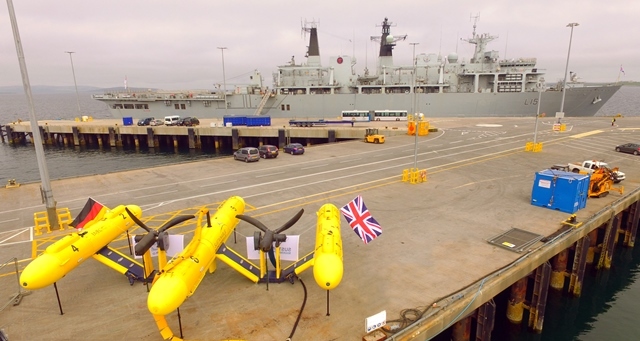 Its unique tidal energy device, PLAT-O, was on display for visiting German and British dignitaries who have visited HMS Bulwark. 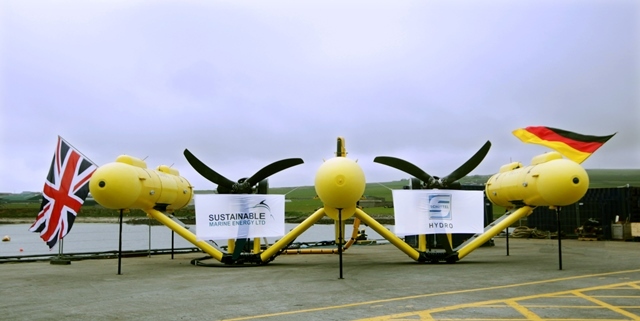 The technology is a joint British-German innovation; designed and built in the UK with the tidal turbines provided by SCHOTTEL Hydro, a German company, which has also invested in SME. The PLAT-O was adorned with the German and British flags as it sat on Hatston pier in Kirkwall, Orkney, to which HMS Bulwark was moored. It was a great symbol of how things have changed between the two countries. Visitors will have noticed this display of German-British co-operation at a time when they were not only reflecting on the animosity 100 years ago between the two nations, but on the strong bonds that have formed since the end of World War Two. “As an innovative British marine engineering company, with a lot of our team having worked across the marine and maritime sector, including in the Royal Navy, we wanted to show how far things have come in 100 years,” says Jason Hayman, Managing Director of SME.